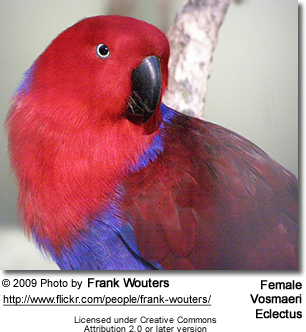 The Vosmaeri Eclectus (roratus vosmaeri) is native to the islands in Northern and Central Moluccas. The Vosmaeri Parrot can be distinguished from the other subspecies by the different purple coloration, size, and the large amount of yellow throughout the tail. Identification of the males in the various subspecies is much more difficult to determine. The usual method being differences in the size of the bird and the shade of green in their plumage. At maturity, the Vosmaeri Parrot averages 15 inches in length. 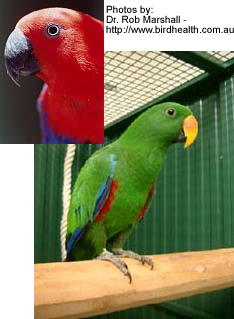 The feathering of the Eclectus Parrot has a strange texture and has been described as "hair-like". Vosmaeri Parrot may be prone to feather plucking. To prevent this, allow the birds plenty of items to chew and try to prevent them from becoming bored. Feather plucking may also be brought on by dietary changes, inappropriate enclosure size, stress, bullying, or climatic changes. Eclectus Parrots have a longer digestive tract than any other parrot, and they need more fresh veggies and fruits than most parrots. The Vosmaeri Parrot is bred commonly in captivity, and generally breed year round. They reach sexual maturity at about two to three years of age. 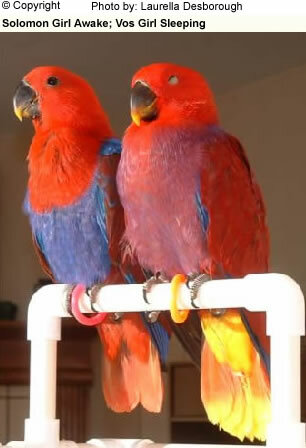 The female eclectus is known to be quite aggressive and dominant towards the male. Before laying, the female will generally spend a lot of time working the nest box. A slanted or L shaped nesting box is recommended. On average, she will lay two eggs, which she incubates for about 4 weeks before they hatch. The fledglings will develop sexually dimorphic coloration by the time they are about 28 days old. Usually, the young will leave the nest when they are about 75 days old.